The three players of interest at the moment are Turkey, Iran and Russia. Historically, each of these countries has en-joyed grand imperial pasts. All are ambitious. All are making a move to achieve a measure of their previous success. Turkey and Iran are posturing to fill the vacuum left in the Middle East with the U.S. invasion of Iraq. Russia is posturing to regain its footing in previous Soviet Bloc countries to slow NATO’s encroachment of its borders, while testing the competence of U.S. President Obama’s foreign policy initiatives. Turkey is considered a moderate Islamic state governed by a secular constitutional democracy. Iran is a terrorist state governed by a radical Islamic Supreme Leader. Russia is simply playing all sides to its advantage while Prime Minister Putin opens the doors to permanently rule. An unlikely cast of characters, but Ezekiel describes in detail God’s plan for the latter days. But before looking into the future, it is wise to review the past. Turkey’s path to its current position has been colorful. Al-though “Islamic,” it is definitely not “Arab.” A group of nomadic Turkish warrior leaders from Central Asia known as the Seljuks established themselves in the Middle East during the 11th century. They founded the Great Seljuk sultanate, an empire centered in Baghdad that included Iran, Iraq, and Syria. From there, they helped to prevent an Islamic sect known as the Fatimids in Egypt from making Shiite Islam dominant throughout the Middle East. In the 12th century, they blocked the inland expansion by the Crusader states on the Syrian coast. Their later defeat of the Byzantines at the Battle of Manzikert opened the way for the Turkish occupation of Anatolia. Seljuk power was at its peak during the reign of sultans from 1063 to 1092. During this time they revived Sunni Islamic administrative and religious institutions, an elaborate bureaucratic hierarchy that provided the foundation of governmental administration in the Middle East until modern times. The Seljuks also revived and reinvigorated the classical Islamic educational system, developing universities called madrasahs to train bureaucrats and religious officials. This era of progress began to decline, however, following the death of sultan Malik Shah to the Mongol invasion in 1243. The Ottoman Turks were descendants of the Turkish warriors of the 11th century. They succeeded both the Byzantine Empire, whose capital was Constantinople, in 1453 and the Arab Caliphate (which claimed the mantle of descent from Muhammad himself), following the conquest of Egypt in 1517. “Ottoman” is derived from Osman I, who asserted the independence of his principality in northwestern Anatolia. Within a century his dynasty encompassed Anatolia, southeastern Europe, parts of the Arab Middle East and North Africa. Take note of the boundaries of the empire on the map below. 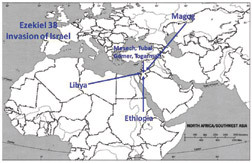 It is of interest how closely the borders of the Ottoman Empire (colored areas) relate to the invaders identified by Ezekiel as Meshach, Tubal, Gomer, Togarmah, Libya, and Ethiopia. The Ottoman Empire was finally broken up at the end of World War I, when its heartland of Anatolia was proclaimed the Republic of Turkey on October 29, 1923. Its first President, Mustafa Kemal Ataturk, sought to establish modern Turkey as a “vital, free, independent, and lay re-public in full membership of the circle of civilized states.” Ataturk saw the need to unify Turkey into a nation state, despite its great diversity, and saw the unification and modernization of education as the key. Ataturk was on his way to “westernizing” the Islamic state. Turkey enjoys the advantage of geography. Anatolia is a plateau surrounded by water on three sides. The Golden Horn (an inlet dividing the city of Istanbul and forming a natural harbor) transforms the well-positioned city into one of the world’s most strategically located ports. Turkey straddles Europe and Asia, the Balkans and the Islamic world, and the former Soviet Union and the Mediterranean Basin. This results in a culture not only incredibly aware of international events, but one steeped in international trade—via land and maritime trade routes. For the better part of the past 2000 years, Anatolia has been at or near the center of human development—whether under the Greeks, the Romans, the Byzantines or most recently the Turks themselves. Following the fall of the Ottoman Empire, for most of the past century, Turkey focused on internal affairs. The arrival of French and British power in the Middle East, followed by American influence and the Cold War locked Turkey into place. During the Cold War, Turkey was basically trapped be-tween the Soviets and the Americans. Reigniting its former glory was unthinkable. In times past, Turkey served as the economic pivot of three continents, facilitating and controlling the trading system of much of the eastern hemisphere. Since that time, Turkey has been slowly reemerging as a key power player. The significant growth in the Turkish economy is a crucial factor in Turkey’s rise. It boasts the 17th largest economy in the world, with a GDP of approximately $660 billion. For the past five years Turkey’s economy has been growing at 5 to 8 percent a year, one of the highest sustained growth rates for any major country. Com-pared to the European countries, Turkey already has the seventh-largest economy and is growing faster than most. It is also considered the only “modern” economy in the entire Muslim world. While Turkey’s manufacturing industry has taken a hit from declining exports to Europe, it is positioned to make up for it through exports to the Middle East. Turkey has already increased exports to Iraq by 75 percent in the first two months of 2009. Turkey also lies in the right spot to transport energy re-sources from the Caucasus and the Middle East to Europe. While the Iranians may have plans to divert Iraq’s oil wealth in the Shiite south toward Tehran, the Turks have the techno-logical skill to ramp up oil production in Iraq to feed the Western market. In fact, they have already put these plans into motion, keeping a Saddam-era pipeline in excellent shape, just waiting to be used. With cash to spare, the Turks have resources to con-tribute to Iraq’s reconstruction efforts, thereby enabling them to purchase political allies with great frequency. Militarily, Turkey is also a preeminent power, with one of the largest standing armies in the world, strong military alliances with NATO member countries and Israel, strategic naval control over the Black Sea through the Bosporus, and a long-standing tradition of military professionalism. As Turkey develops economically, it develops militarily. It then becomes the influential leader in many regions—that is what it means to be a pivotal power. In March, Turkey hosted an international military exercise with the armed forces of the U.S., Belgium, the Netherlands and Britain. Turkish Air Force and Land Force also participated. Ships, submarines, amphibious, ground and naval infantry forces participated to boost coordination and cooperation. U.S. President Barack Obama graced Turkey with his first official visit to a Muslim country. Secretary of State Hillary Clinton told the press after meeting with Turkish leaders in Ankara, “We share a commitment to democracy, a secular constitution, respect for religious freedom, belief in a free market, and a sense of global responsibility.” The world viewed Obama’s decision to visit Turkey this early in his administration as a clear signal of his recognition of Turkey’s growing prominence in the region. There were many issues discussed as the U.S. makes plans to draw down its presence in the Middle East to focus on Afghanistan, and Turkey begins to flex its muscle in the region after years of post-Ottoman hibernation. In his speech in Ankara, Obama also spoke of helping the Turks achieve their goal of entrance into the European Union. It is not clear to the intelligence community why Turkey wants to be an E.U. member, but U.S. assistance in the process is now on the plate. Turkey is clearly preparing to step into the vacuum left in the Middle East with the U.S. invasion of Iraq in 2003. The platform of its rise from the ashes of the Ottoman Empire is its economic and military strength. Turkey is a complex society, with a secular regime protected by a military charged constitutionally with that role—and a growing Islamist movement. Ezekiel foretells of a time “in the latter years” when Gog and “all thy bands and many people with thee” shall ascend and come like a storm against the land of unwalled villages against the mountains of Israel. The purpose: “To take a spoil, and to take a prey: to turn thine hand upon the desolate places that are now inhabited, and upon the people that are gathered out of the nations, which have gotten cattle and goods, that dwell in the midst of the land” (Ezekiel 38:12). The response: “Sheba and Dedan (Saudi Arabia), and the merchants of Tarshish, with all the young lions thereof, shall say unto thee, Art thou come to take a spoil? Hast thou gathered thy company to take a prey? To carry away silver and gold, to take away cattle and goods, to take a great spoil?” (Ezekiel 38:13). The world witnesses a brazen act of aggression yet only asks if the purpose is to take a spoil. Is it because Turkey is “influential” in these countries and they choose not to engage this ally for Israel’s sake? Perhaps in the end, Turkey pulls off the perfect east-west balancing act. Next month, Part 2 of this series will discuss the second prominent player in this trio, Iran (Persia), and its current competition with Turkey for prominence in the Middle East, including its growing relationship with Russia. June 2009 Personal Update NewsJournal.